In the fall of 2010, photographer Pete Pin devised a makeshift portrait studio in his grandmother’s garage in Stockton, California. As he photographed her, she recounted the details of her family’s experience in Cambodia during the regime of the Khmer Rouge. It was the first time she had ever shared these memories, and Pete found himself struck by a sense of “history and a connection to the past that had been for so long withheld…”. Strongly effected by the encounter, Pete began talking to Cambodian-Americans all across the country, attempting to parse their personal stories — ones of “trauma, displacement, and resilience” — into a larger, collective tale of perseverance and, most importantly, hope. 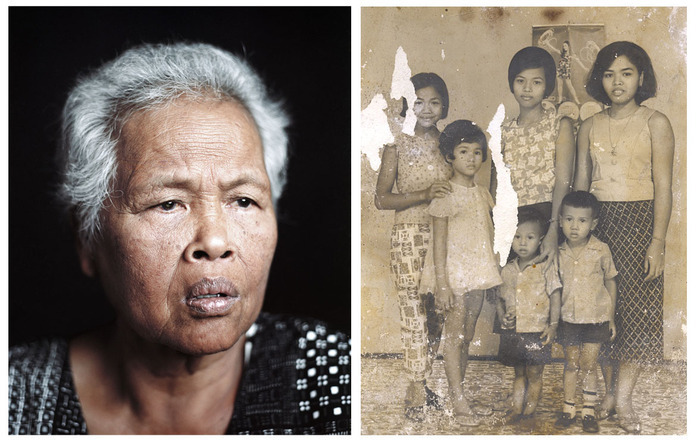 The finished portrait of his grandmother is above, alongside a pre-revolution family portrait that was one of only two family possessions saved from before the Killing Fields, in 1972. Hear more stories, and check out more of Pete’s work, by visiting his project page here.